Somerville Pads, working in conjunction with Boston Pads, has published this average rent price infographic for the city of Somerville. These averages were calculated from the Boston Pads database, containing over 156,000 Greater Boston apartments, 500,000 apartment photos, and over 8,000 apartment videos. Somerville Pads formulated the average rent from 397 Somerville apartments that are currently available or have been rented over the previous 12 months. To get the real time vacancy rate, they found the sum of currently available apartments and those that will become available in the coming months, and divided that total by the number of Somerville apartments in the database. The US Census Bureau was tapped for information on population and average household income. Interestingly, Somerville is the most expensive area out of the 22 sampled to rent a studio apartment, at $1,855 per month, well above the 2nd highest studio average of $1,801 per month in Beacon Hill. 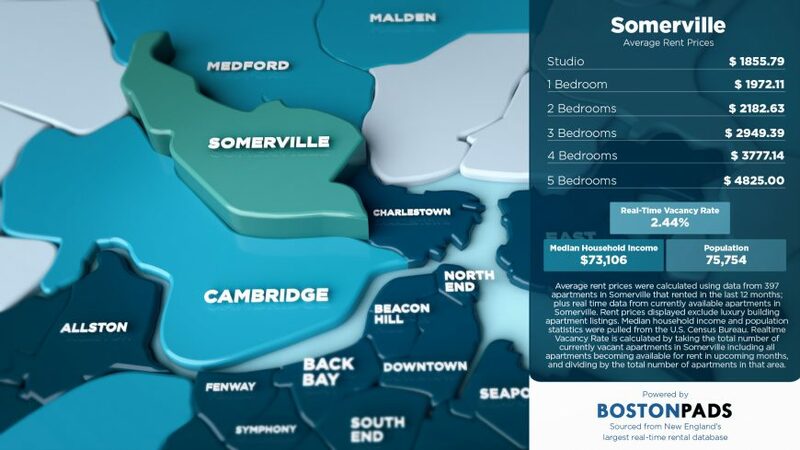 For all other size apartments, Somerville is close to the middle as far as average rent prices. The city ranks 10th highest for 1-bedroom apartments, 13th highest for 2-bedroom apartments, 11th highest for 3-bedroom apartments, and 6th highest for 5-bedroom apartments. Compared to the average rent prices in Cambridge, Somerville residents are paying less for 1-bedroom, 2-bedroom, 3-bedroom, and 4-bedroom apartments. Somerville comes in slightly pricier than Cambridge for 5-bedroom apartments, and almost $100 more per month for studio apartments. Compared with average rent prices in Medford, Somerville residents are paying considerably more for all size units. Residents of Somerville can expect to pay $400 more than their Medford counterparts per month for a 1-bedroom, $500 more per month for a 3-bedroom, and $600 more per month for a 4-bedroom apartment. Somerville Pads, and all the data you see here, is powered by the Boston Pads database. Anyone can access this data via a professional phone staff and licensed real estate agents seven days a week. Landlords routinely call to learn about the rental market in a given neighborhood. For example, they may ask about current rent prices, vacancy rates, trending topics, and more. Boston Pads uses this data to help local landlords increase rental income and decrease vacancy times. This location-specific focus on data has helped Boston Pads build a network of over 16,000 Greater Boston landlords. Property managers listing with Boston Pads get the broadest marketing coverage possible from one source. Boston Pads posts listings to nearly all the national listing sites including Zillow, Craigslist, and Trulia, over 80 local real estate listing websites, and 100+ local social media pages on Facebook, Twitter and YouTube. By providing the most comprehensive marketing strategies and the most accurate, timely data, Boston Pads has distinguished itself as the real estate and information technology leader in New England. One of the strengths of their platform is its versatility. Boston Pads technology can scale and adapt to any market, and any agency or landlord looking for marketing and real estate tools to save time and increase revenue is welcome to utilize it. To see more average rent prices for towns in the Greater Boston area, check out our latest infographic on average rent prices in Boston by town.